BMW Group has been using 3D printing for more than 25 years, and in the last decade has produced a million parts using the technology. This year alone, the company expects that it will 3D print more than 200,000 components, a 42 percent increase over last year. And BMW Group is just getting started. The company is aggressively pursuing additive manufacturing, intent on staying ahead in an automotive industry that is rapidly embracing the technology. BMW Group’s millionth 3D printed component came recently in the form of a 3D printed window guide rail for the BMW i8 Roadster. It took only five days to develop and was quickly integrated into series production. The guide rail, which is located in the door of the Roadster, allows the window to operate smoothly. It was manufactured using HP’s Multi Jet Fusion technology, which is now being used in the series production of automobiles for the first time. The technology is capable of producing up to 100 window guide rails in 24 hours. Additionally, BMW uses EOS Selective Laser Sintering and various other technologies for metal and polymers. The window guide rail isn’t the only 3D printed component in the BMW i8 Roadster – it wasn’t even the first, actually. The first was the fixture for the soft top attachment, which was 3D printed from aluminum alloy. It is both lighter and stiffer than the traditional injection molded plastic component used in its place. This year, the component won an Altair Enlighten Award in the Modules category. BMW Group began using both plastic and metal back in 2010 for the production of a smaller series of components such as the water pump pulley for DTM vehicles. In 2012, the company began using laser sintering for several components for the Rolls-Royce Phantom. While many automotive companies are using 3D printing in their manufacturing processes, a lot of them are mainly using the technology for tooling purposes. BMW Group has been one of the pioneers in using 3D printing for actual functional car parts. The company has big plans for 3D printing in the future. Recently it began offering several customization options for the BMW MINI, many of them 3D printed. Last year BMW Group began using 3D printing for the fiber optic guides in the Rolls-Royce Dawn; Rolls-Royce currently has 10 3D printed components in its product line. 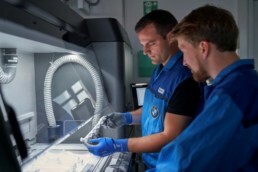 It was just earlier this year that BMW Group built a new dedicated Additive Manufacturing Campus, which likely at least partially accounts for the drastic increase in 3D printed parts over the last year. The two 3D printed components in the BMW i8 Roadster were designed and produced at the Additive Manufacturing Center, among many others. BMW Group has long been a leader in 3D printing in the automotive industry, and it clearly intends to hold on to that designation.